It is estimated to sell for £6,300 ($8,000) to £9,500 ($12,000) in Wednesday’s auction. 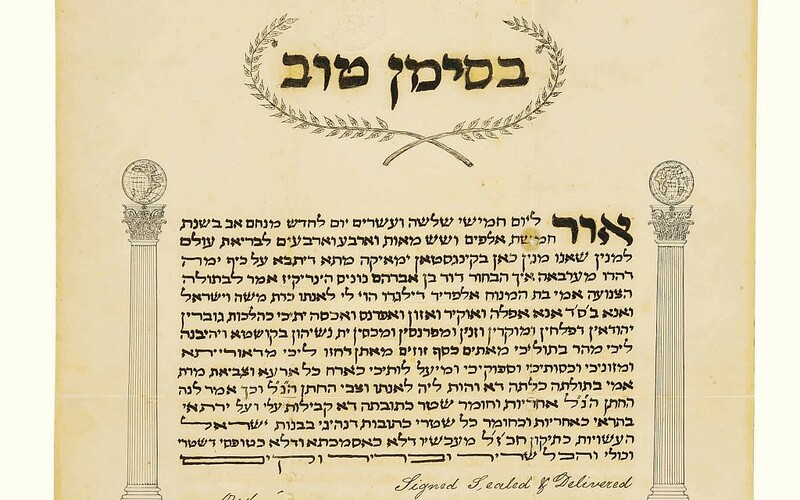 It is the first time that Sotheby’s has offered a ketubah from Jamaica. 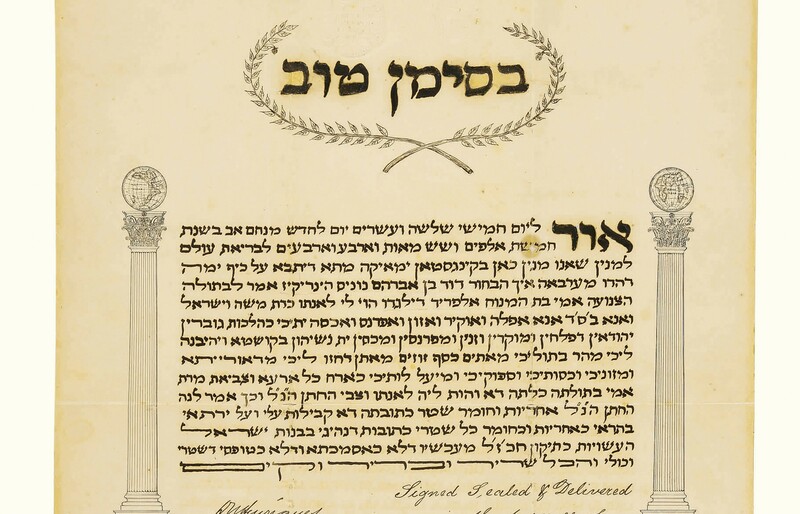 The ketubah marks the marriage of David ben Abraham Nunes Henriques and Amy bat Alfred Delgado in Kingston on Wednesday night, 23 Menahem Av 5644 (August 14, 1884). The bride’s grandfather, Moses Delgado, was a major figure in the history of Jewish Jamaica. President of the Kaal Kadosh Shahar Ashamaim, the Sephardic synagogue of Kingston, he was responsible for the successful campaign in 1831 granting full civil rights for Jews. Jews from Portugal began settling in Jamaica in the first half of the sixteenth century, but since the island was a Spanish colony, they could not practise their religion. After the British occupied the island in 1655, Jews were granted religious freedom and the local Jewish population grew. By the close of the eighteenth century, Kingston was an important centre of commerce with two functioning synagogues. 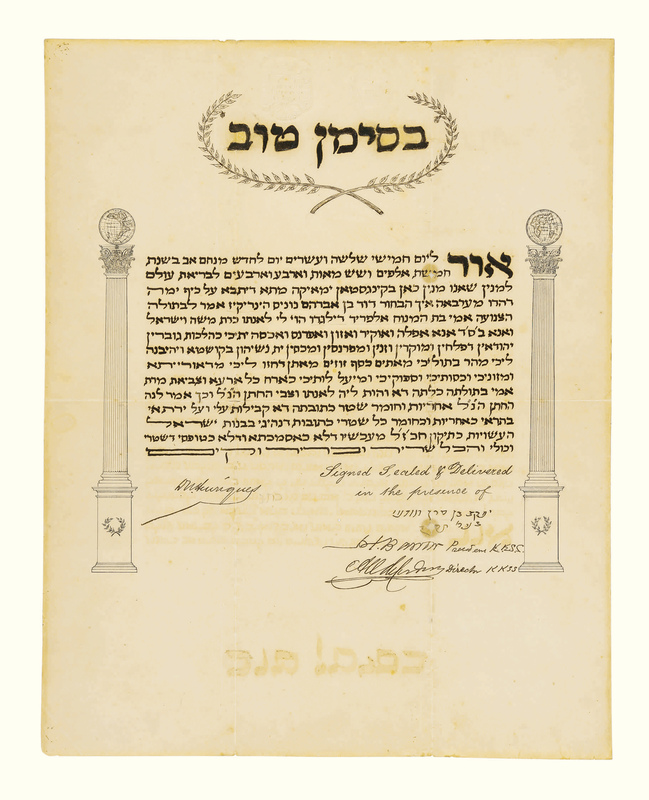 Kingston was mostly destroyed in an earthquake in 1907, making the document “a rare and historically valuable relic of nineteenth-century Caribbean Jewish life,” according to the auction catalogue. Other ketubahs being auctioned are from places in Italy and Bayonne, France. Other items include Judaica such as Torah shields and crowns, seder plates, mezzuzot and menorahs, as well as rare Jewish books.